Soundcrash & The Doctor’s Orders are poised to present the UK premiere of ‘Beats, Rhymes & Life: The Travels of A Tribe Called Quest’, Michael Rapaport’s award winning film documenting the highs and lows of Hip Hop’s most radical & innovative group A Tribe Called Quest. This combustible film features an original soundtrack by Madlib and delivers a host of humorous & insightful interviews with hip hop luminaries like ?uestlove, De La Soul, Ghostface Killah, Pharrell Williams, Adam Horowitz and Mary J Blige as well as extensive accounts from Q-Tip, Phife Dawg, Jarobi White and Ali Shaheed Muhammad. This is a labour of love … you need to check it! 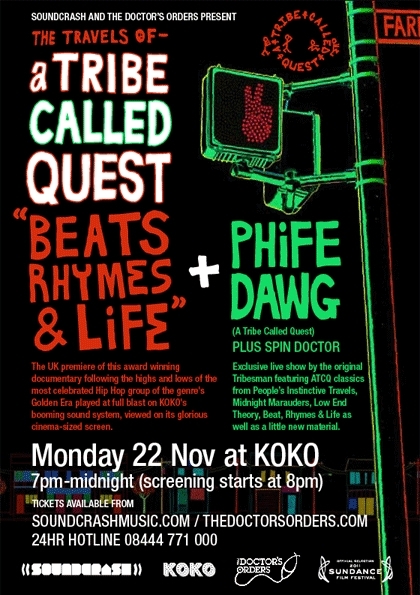 The screening will be followed by an exclusive live show by the man called Phife Dawg featuring nuff Tribe classics as well as new material. MESSAGE TO THE DISTRIBUTORS: Need that cinema showing… you know, big screen, fat sound and lush seats! I need to kick back to watch that movie! This entry was posted in Words, Sound & Power and tagged Doctors Orders, Film, Hip Hip, Michael Rapaport, Native Tongues, Phife Dawg, Q Tip, Tribe Called Quest. Bookmark the permalink.